Hi everyone! Wearrior A here! After a long few weeks of hiatus, I am happy to announce that we are finally back online on Wearrior Instinct! It's been such a long summer break for us. We are now all recharged and ready to restart our cycle! For our comeback post today, I'll be writing along side our Wearrior Mu'izz! It is centred around our experiences with our graduation! That's right! You heard it right! The three of us are now holders of bachelors degree! 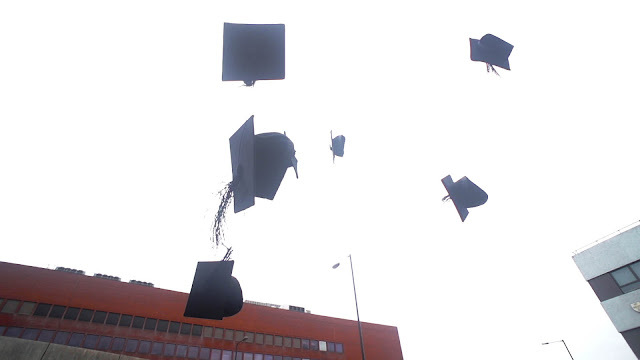 We'll be writing about what we wore and general tips on how to prepare for your graduation day ceremony. Hello everyone! 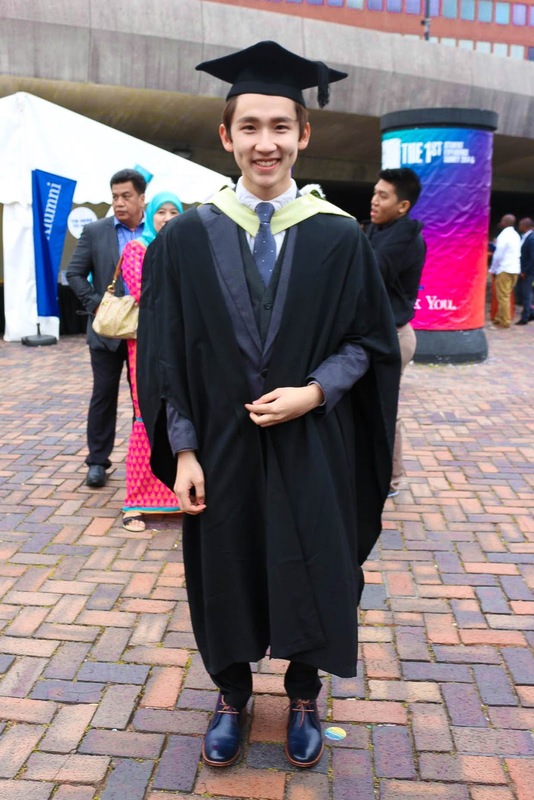 Luckily this year, my graduation fell on the day of Eid celebration in the UK! 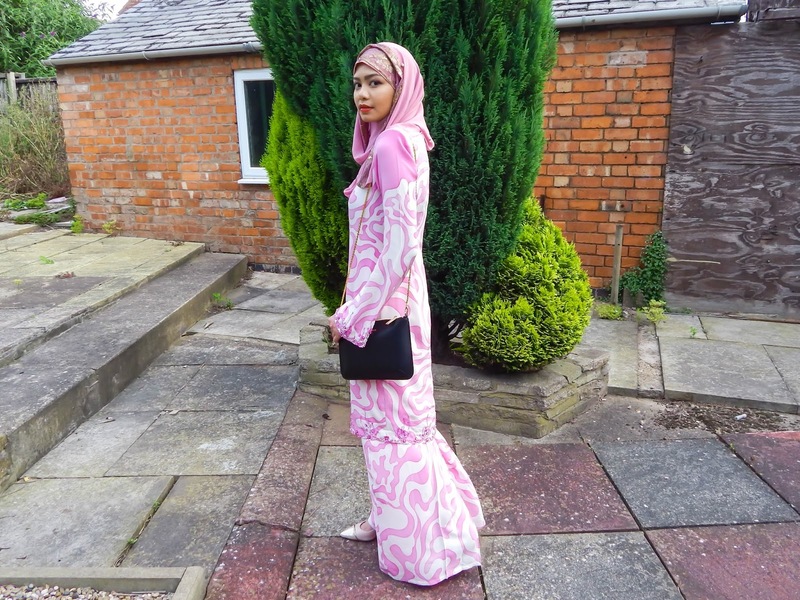 Which meant that we had a double celebration for completing our Ramadan in the UK and getting my award for my first bachelors degree in Biological Sciences! In the University of Warwick, graduation could either fall in the morning or afternoon. My award ceremony was held at 11 in the morning so I had to prepare the night before. Trying to keep hydrated was definitely a challenge while I was fasting in the UK. Especially in summer, my skin was much drier than usual and since I have sensitive skin, I was breaking out by the end of the fasting month. To make sure I had good make up application for the next day, I treated my skin with the Facial Treatment Mask by SK-II before bed. It definitely left my skin supple and hydrated the next day! As for make up I kept it simple. I used the Urban Decay Naked 3 eyeshadow palette for my eye make up and went for Shu Uemura's Face Architect Smooth Fit Fluid Foundation for my face and went for a red lip to add vibrance to my whole look. I decided to go traditional for my graduation ceremony. This time, I left my outfit planning all to my mom! I knew I wanted to go traditional baju kurung for the day and decided that I'll leave the designing to my mom since it was also technically her special day too! She got me two tailored baju kurungs, both made of kain batik. The batik is a fantastic choice for graduation because the design really sticks out in photos and from afar. Both my mom and I, decided that pink was definitely more fitting for the occasion as it provides a great contrast to the black robe. As for shoes, I went for a classy pointed mid heel from Dune's London. I paired my baju kurung with a pink hijab and wore a black sling bag from Ted Baker's which was gifted by my significant other, Zhafir. Voila! The full graduation outfit! 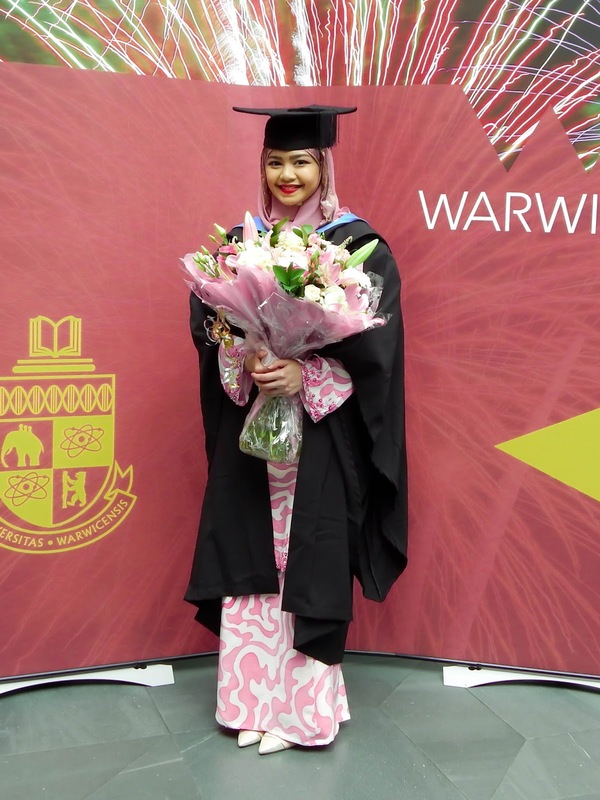 As you can see, the pink batik design really stands out from the black robe! It is important to get enough sleep the night before your graduation ceremony. I dozed off in the hall where I was seated and nearly dropped my mortarboard (graduation cap) for not getting enough sleep. I also found it helpful if you have a small bag to bring into the graduation hall. Make sure to bring your phone (in case of the long wait) and also a bit of make up in case you need to do any last minute re-touching. For the hijabis, I would definitely recommend to not tie up your bun so high otherwise you'll have difficulty in positioning the mortarboard properly on your head (first hand experience here unfortunately! haha). On the bright side, the shape of your hijab is not as important as the mortarboard will cover the forehead area anyways! I decided to style the gold lining of my hijab by framing my face, I find that it looks really nice especially from the side! Lastly, if you decide to go for the traditional baju kurung on your special day, remember to bring loads of extra pins! The graduation robe is really heavy and kept on slipping to the back! I had to reposition my robe every time I took a photo. This is my last photo shoot in the UK, I'll be blogging straight from the mother land (Brunei) from now on! I'll see you soon! Hey everyone! I am the last but not least to write for this post, coincidentally my graduation ceremony was literally the last one out of us three; it fell on the 24th of July! The graduation ceremony happened in the early morning, specifically at 9 AM, it was very early in the morning. It was a bit hectic for me as well because my brother and I, were also busy shooting my graduation video and I wanted to include my friends in it as well. So, before and after my graduation, we were busy shooting the scenes. I am now back in Brunei! It's been quite hectic for most of us, I think I speak for all of the wearriors. Thus, that explains the hiatus for this blog. First of all, Thank God, that this summer is a bit weird because it doesn't feel like a summer at all, as it was actually a bit cold, compared to previous summer that I have experienced. Henceforth, I decided to go for my Hugo Boss Blue-ish Grey coloured suit because I do not want to wear anything black, as the graduation robe is all black except for the hood. I personally love grey and blue as colours because both are soothing colours for my eyes. Therefore, everything is accessorised with the shades of blue and grey. I have decided to buy this beautiful grey tie that caught my eye, it has a diamond-like stud on it, so that's a bonus for me. As for the shoes, my parents decided to buy me a Ted Baker shoe for my graduation, it is dark blue in colour with a reddish-brown lining and laces. Truth be told, I actually wanted to go for a bowtie! But, after listening to my previous guy friends who graduated before me, in which all recommended of using a tie. I completely agree that it is preferable to use a tie because it can hold the hood, rather than a small bow tie. Oh, and do make sure if you're planning to buy a new shoe for graduation, try buying it a week earlier and actually wear it first! I bought mine the day before and wore it on the day, it was very slippery! The last thing you want is falling from grace on your graduation day. That's it from me! And below is a video of my graduation, you'll be able to see bits of pieces on how the ceremony goes, as well as, the happy moments that my friends and I have felt on the big day. That's it from us for today and stay tuned for our upcoming posts. For our next post we'll be collaborating with Brunei's very own Make-up Artist, Anisah Alkaff! We're extremely excited! By the way, don't forget to like us on our new Facebook Page!